Where’s the New Year’s Bhav? 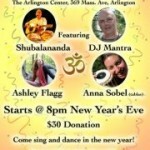 It’s almost New Year’s Eve…do you know where your kirtan is? Maybe it’s me, but doesn’t it seem like there’s a plethora of choices out there for the conscious kirtaniya who seeks something other than paying too much for dinner and drinking too much for driving on the last night of the year? Judging by the bounty of bhaktified celebrations being touted on Twitter and Facebook, 2012 is going to arrive with a bhavalicious bang. We’ve pulled together a “Dream List” of events across the country that we’d like to be teleported to on the eve of 2012, along with a few very special Jan. 1 programs that promise to keep the bhav flowing and welcome the new year with a wave of bhakti bliss. This one’s at the top of my list, but if you don’t already have a ticket, you’re out of luck. The bhakti bash in the Berkshires, which started Thursday night, is sold out. On board for the weekend are David Newman (aka Durga Das) along with his beloveds, Mira and Tulsi; Sean Johnson and the Wild Lotus Band all the way from N’awlins; John de Kadt playing in his own back yard and regrouping with Sita & the Hanumen; Shantala (aka Benjy and Heather Wertheimer), hot off a cross-country tour and armed with a brand new CD that everyone’s raving about, and the inimatable Gaura Vani and As Kindred Spirits, featuring the dancing violinist everyone loves, Jahnavi Harrison. Dreamtime NYC sounds, well, dreamy. An all-night cornocopia of consciousness-raising and culture, including kirtan (duh! ), yoga, art, contact improv, meditation, and sacred ceremony. Check out the full line-up of artists and activities here. If you’re looking for something more low-key and introspective in your evening activities, Jivamukti on Broadway might be the place. From 8 to 9 p.m., the golden-voiced, deeply devotional young chantress Anjula Prasad will lead kirtan, followed by a 3-hour silent meditation and a special midnight address by Jivamukti founders Sharon Gannon and David Life. For the full monty, come early for asana practice and vegan dinner. Kirtan infiltrates First Night Boston! A traditional Hare Krishna harinam through Copley Square and the Back Bay, led by Krishna devotees Niranjana Swami and Rama Raya Das, follows arati and darshan (beginning at 7 p.m.) at the ISKCON Boston temple. 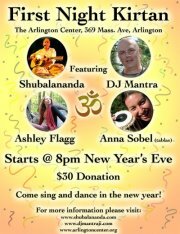 Then, head over to The Arlington Center for First Night Kirtan, featuring Dancing Kirtan with Deejay Mantra, Shubalananda, with Ashley Flagg, and Anna Sobel on tabla. Don’t believe for a second that the New Year’s bliss is limited to coastal hubs. Out in Texas, The Bhakti House Band is hosting a 12-hour kirtan at The Bhakti House (where else?) in Fort Worth, with The Sound and the Meaning, Prema Shakti, and Rudra Das & The Dharma Love Train. Built into the family-friendly evening and pot-luck dinner will be an “open mic” period for anyone who would like to also share a chant. Details here. 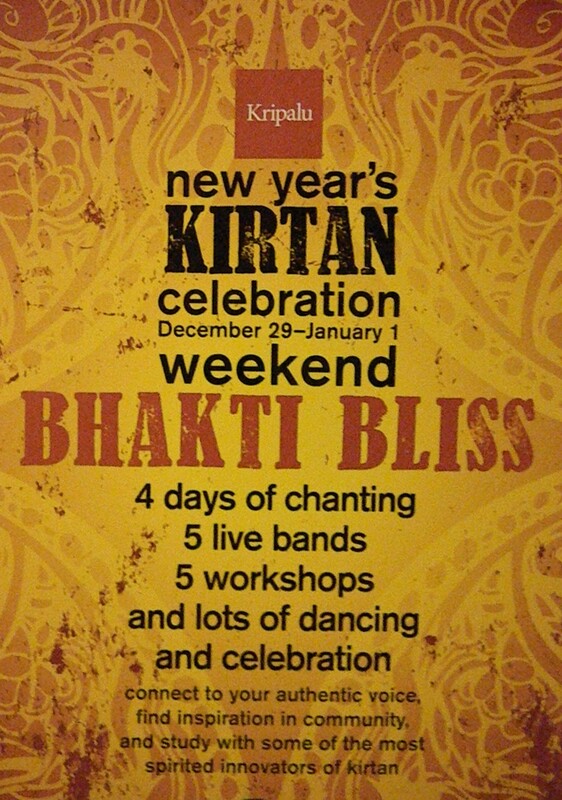 In Sedona, you can Chant in the New Year with the Kirtan Wallahs for the eighth year in a row at 7 Centers Yoga Arts. The Raw Spirit Fest will rock in the New Year with Donna De Lory, Fantuzzi and much more in Phoenix. In Minnetonka, Minn., join Kirtan Path and the Wild Moon Bhaktas for four hours of kirtan and a midnight ceremony at the Living Waters Market and Center for Harmonious Living. Princeton, NJ? Check out Bliss in the New Year, featuring kirtaniyas Suzin Green, Dan Johnson (table) and Kartikkeya (percussion) at the Princeton Center for Yoga & Health. Up in Wolfe Island, near Kingston, Ontario, Brenda McMorrow is headlining a five-day kirtan and meditation retreat called “Opening to Your Divine Life.” Sounds divine, doesn’t it? Why should the bhav stop at midnight? We’ve heard about some great New Year’s Day programs that will keep the spirit flowing long after the ball drops. Our top pick: 108 Hanuman Chalisas. This has become an annual tradition at many yoga centers, but perhaps most famously at Dharma East in NYC. Chantress Nina Rao will be leading her signature “Nina Chalisa” (as heard on Krishna Das’s “Flow of Grace” CD), and she will be joined by a number of other wallahs including Ambika Cooper, Shyama Chapin, Sharada Kagel, Jeremy & Lily Frindel, Keshav Das, and more. Admission is free and you can join or leave anytime. 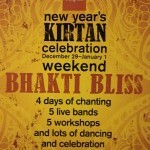 Best of all, if you can’t make it to NYC, you can join the Chalisa chanting via live-stream at www.chantkirtan.com. If you’re bhavving in the New Year at Bhakti Yoga Shala, don’t go anywhere: the bhakti love continues Sunday when Govindas and Radha will “sensitively yet courageously lead us through the purifying and transformative ritual of 108 Sun Salutations.” Details here. Who could resist starting off 2012 with Girish and DJ Drez? ‘They’ll be joining yoga teacher Janet Stone for “Sankalpa: Awakening Your Soul Vision” at Yoga Tree Castro in San Francisco for a morning workshop to greet and “clarify your heart’s intentions for the year to come” through asana, breath, music, mantra and tantra. Whew! And that’s just a sampling. We know there is so much more out there — and we want to know about it! Where will you be chanting this New Year’s Eve/Day? Dave Russell is doing kirtan as part of First Night in Northampton, MA for the second year in a row, 7-7:45 at the First Church of Christ Scientist! Satchidananda Ashram Yogaville has Sam Rossitto leading kirtan (his CD is Lotus Tattoo) on NYE, with other events including a Spanish classical guitar musical offering and midnight meditation at the LOTUS shrine. I saw on Jayadeva’s feed (also known as Jdavyd Williams) that he was heading to Yogaville today. I’ll be in residence in the dorm NYE night. OM Shanti. Please join us on New Year’s Day at 11 am at our home in Lincoln, MA to chant the Hanuman Chalessa seven times, followed by meditation and then a potluck lunch. Sita Ram! Many blessings for 2012! Email for directions.